Sunday’s Spacex Falcon 9 Telstar 19 VANTAGE ripping through the atmosphere and off into space. Seriously, this never gets old. It’s amazing every time. I met up with a friend and his dad near the Kennedy Space Center late Saturday night. After two failed meet-up attempts this year, we picked a spot to rendezvous at before heading to the pre-planned shooting location. We drove into the middle of nowhere on Merrit Island, north of the launch site. The road to the original spot we picked was closed. We then convoyed our trucks around the island, looking for a new spot. We did some mild off-roading, wandered (on foot) seemingly aimless through the brush and intercostal marshes until we found this amazing spot to shoot from. To get to this spot, we had to drive down a random dirt road. We then had to hike in through more brush and marshland. There were sort-of trails about half the time. Using Google Maps, we identified four potential shooting spots at this location. One was just kinda gross; I’m not even sure what we were stepping on. One we couldn’t get to due to water. One was pretty good, but not quite it. The last was perfect. After we found the spot, we had to hike back to the trucks to get our gear and then hike back into the spot. We covered a total of about three and a half miles just walking around that night. It was a little cloudy once we got set up, but was clearing quickly. As the clouds broke, I got off about 16 minutes of star trails leading up to the minute before the launch. This is a blending of the star trail composite and the launch shot. 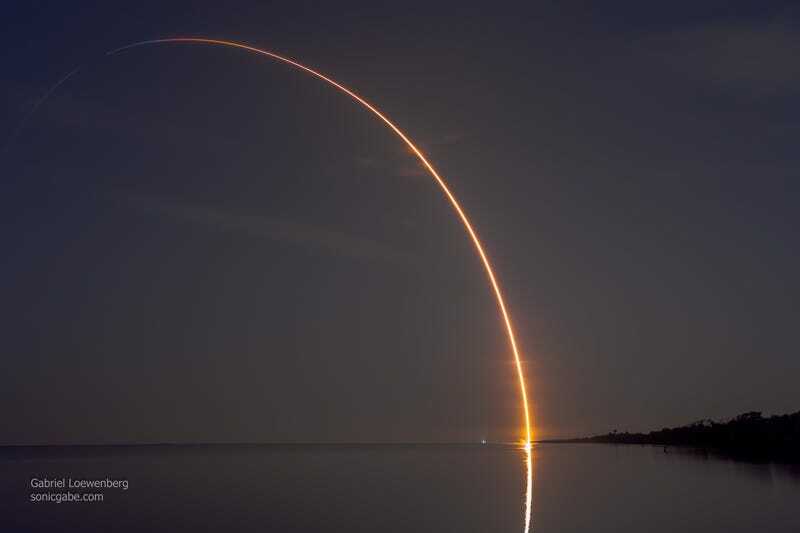 The launch is a single 288-second exposure on my Nikon D5200 at ISO 100 and f/10 using my Nikon 18-300mm (at 18mm). That shot was so full of noise, I was worried it wouldn’t be usable. This is part of that shot with only some basic exposure and highlight/shadow adjustments done to the RAW file. I apparently automatically watermarked this. This is my noise, damn it! I don’t want to see it posted anywhere without at least a credit! That noise was bad. I pulled out all the stops and made it vanish without screwing up the shot! I couldn’t begin to even explain exactly how I did it. The star trails are 33 consecutive 30-second exposures at ISO 1000, f/3.5 and 18mm. I merged the star trail frames in Sequator and did the rest of the editing and the blending of the two images in Photoshop and Lightroom. If you look carefully at the blended shot, there is a wee little meteor in there, too. It’s near the middle and looks almost like a rogue star trail that doesn’t want to do what the rest are doing. Off the top of my head, there are three more upcoming night launches in the next four or so week. I’m going to try to get to all of them. Also, if the stars align and everything works out, I might get to watch baby sea turtles emerge from their nest in a few weeks. I’m invited. It’s just a matter of being there when it happens.